Misty is leaving! When two movie men offer to make Misty a star, Paul and Maureen can't refuse. It's just the right thing to do. After all, Misty should be shared with children everywhere! 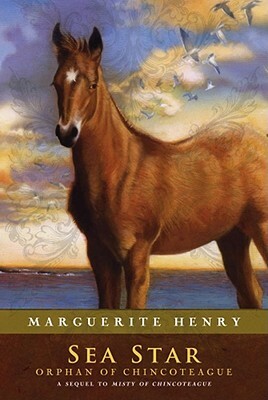 But before Paul and Maureen get a chance to miss Misty, they find a young colt on Assateague Island! Its mother lies dead on the beach, leaving the poor colt to fend for itself. Without a mother it will die! Can the two children be a substitute mother for Sea Star? Follow the little pony's heroic struggle for life. It's a story you'll never forget!